This is an abnormality of the positions of the two ventricles, or pumping chambers of the heart, and the two great arteries, the aorta (which carries blood to the body) and the pulmonary artery (which carries blood to the lungs). In this condition, the atria, or upper chambers of the heart, are in their normal positions. Blood from the right atrium crosses a mitral valve and enters a morphologic left ventricle that is on the right side. The blood leaves this ventricle and enters the pulmonary artery that is also in the wrong position. It is posterior or behind the aorta, which is opposite of the normal heart. Blood from the left atrium crosses a tricuspid valve and enters a morphologic right ventricle that is on the left side. The blood leaves this ventricle and enters the aorta that is also in the wrong position. It is anterior (in front of) to the pulmonary artery which again is opposite of the normal heart. Transposition of the Great Arteries: L-Type may be associated with Ventricular Septal Defects (VSDs), or holes in the muscle wall that separates the two ventricles. In addition, the pulmonary artery (PA), which carries blood from the heart to the lungs, may be narrowed (Pulmonary Stenosis). 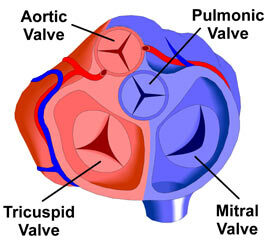 Abnormalities in the form of the tricuspid valve and with the heart's natural pacemaker may also occur.